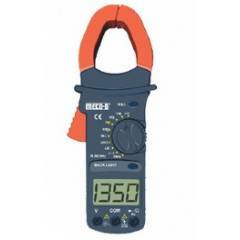 These clamp meters can measure AC Current, AC Voltage, DC Voltage, Resistance, Temperature and Frequency. These Clamp Meters are used in various industries across various sectors for maintenance and manufacturing. MECO-G has introduced a new series of Digital Clamp Meter in 3Â½ digit LCD display incorporating latest technology. Additional Features include Diode Test Continuity check Data Hold and Back light.